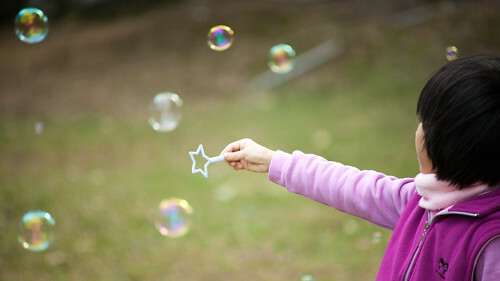 Star and bubbles, a photo by Dennis Wong on Flickr. I spent most of this weekend feeling hugely emotional, really rough, completely shattered and in pain. But also this weekend I found myself feeling incredibly lucky and happy. My family have been wonderful at looking after me. I only have a cold but it's been a particularly nasty one which has completely floored me. I have been especially impressed by my children who have been total superstars. My daughter has been running around getting things for me and my 22 month old even figured out not to give mummy any hassle. But most of all this weekend I felt lucky and blessed that I can hold both my children in my arms and hug them tightly. On Saturday I went to the Matilda Mae Remembers memorial service where we remembered all the babies in the sky who were taken from their families far far too soon. It was a heartbreaking day but it felt good to be in the presence of such courageous mothers. It was also wonderful to get the opportunity to publicly remember all those little lives that were tragically cut short. I also got the opportunity to make some lovely new friends and to spend some time with my dear friend Heather who I don't get to see very often as she refuses to completely uproot her life and move down south! Anyway, today's photo had to be a tribute to Matilda Mae and I think this one I found is perfect. Pink, purple, stars and bubbles. I hope the wonderful Jennie approves and I hope Matilda Mae looks down from the sky and loves it too. What a truly perfect photo. I'm so sorry you're poorly. It's got me today, I've spent most of the day in bed or on the sofa - it's a cold but really in my head causing pain and headache (hence me not being online).